Dave Bailey (this one, not this one) is a man who swapped life as a publican to try his hand at full time professional brewing. He did so by taking a risk, investing in equipment and premises and setting up the Hardknott brewery in Cumbria. Notable achievements to date include: whisky barrel aged imperial stout Aether Blaec, 10 per cent barley wine Granite and being an all round thoroughly nice bloke. 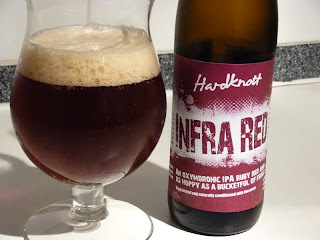 My first taste of the Hardknott range came in the form of Infra Red, a beer described as a “hybridised red, amber ale, made with copious amounts of cascade and centennial [hop varieties]”. It pours a plum red colour with a fluffy white pillow of head on top. The aroma has something nutty or sesame about it, perhaps a spiciness that might be a result of crystal rye being used. There’s fruity hops in the background but they play second fiddle to everything else, it’s not as hop forward as the “hoppy as a bucketful of frogs” description suggests. In the mouth it’s quite light and sprightly for its 6.5 per cent. Again I found the hops to be more reserved than expected, there's some pithy citrus there but the dominant character is a pronounced grainy quality. There’s the suggestion of sweetness up front, complemented by some caramel and burnt sugar, then a nice dry finish that lends itself to good drinkability. Being critical, I found there to be a slight tannic, almost smokey note towards the end, perhaps from the use of too much crystal malt. A very enjoyable beer and a great effort considering that the Hardknott brewery is still very much in its embryonic stages. Looking forward to the bottles of Aether Blaec and Granite now. I loved Infrared & Aether Blaec. Granite was less my cup of tea personally, but still very interesting to try, but I'm so excited to see a new Brewery trying something different instead of traditional middle of the road stuff. I too didn't find it hoppier than frogs, but almost cloying with sweetness from the crystal malt. The label is a BrewDog rip-off style. And it's not an IPA. Controversy, that's what we like, thanks Anonymous. Ben: I agree, always good to see this type of beer being made in the UK. As I say in the blog, yet to try Aether Blaec and Granite but looking forward to it. Anon: I found it to be lacking in sweetness not cloying at all. I think when I shared one with Dave, I reckoned there was too much crystal malt. Too much crystal malt then Dave?